These Beautiful Chanukah Candles Are Hand-Made In Israel By Safed Candles. 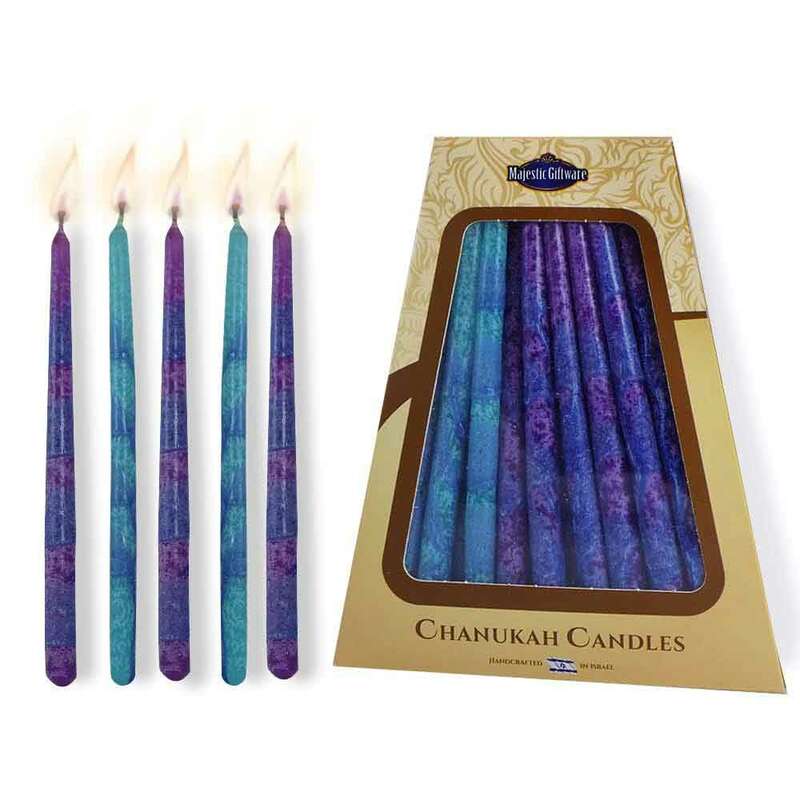 The Blue And Mauve Hanukkah Candles Come In A Box Of 45 Candles. Enough Candles To Last All 8 Nights Of Hanukkah. These Traditional Candles Are Carefully Dipped And Hand Decorated With An Overlay Design By Skilled Artisans In The Ancient City Of Safed. The Hanukkah Candles Are Sized To Fit Most Menorahs. They Are Approximately 5.75" Tall With Varying Widths Between 4/16" To 6/16". These Dripless Candles Burn Bright And Clean For More Than One Hour. High-Quality, Lead-Free Wicks. For Best Results, Keep Candles Refrigerated, Do Not Burn Them Near An Open Window Or Air Conditioning Vent, Never Leave Lit Candles Unattended And Children Should Always Be Supervised. Ordered and received several different color Safed Chanukah and Shabbat candles and they arrived in good condition within the time frame expected. Very pleased. Unfortunately could not use discount coupon as well as free shipping despite the order being over $100.